Cakes And Cream are makers of cakes of all sizes and shapes. Cakes and Cream also come in different flavors such as lemon, chocolate, strawberry, butterscotch, banana almond and coconut. You can also customize your cake and have your cake made in various shapes,sizes,flavours,characters and colors. Appetizers Delite is a subsidiary of Cakes and Cream. Appetizers Delite specialize in making tasty desserts such as: rich chocolate gateaux, crème cake, cheese cake, red velvet, black forest gateaux, velvet gateaux, carrot cake, swiss roll, crème caramel, trifles etc . Q: Cakes And Cream contact details? 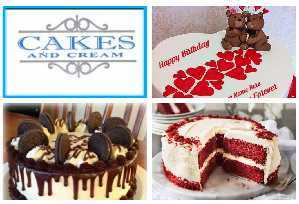 Cakes And Cream currently have 4 branches in Lagos located in Ikeja, Ojodu Berger, Surulere and Victoria Island. Q: Cakes And Cream contact phone numbers?